The Samsung Galaxy Fame comes with the default Jelly Bean Gallery which, as you'd imagine, has been treated to some TouchWiz flavor. It opens up in Album view, where rather than the familiar stacks, the app uses a grid of photos, two to a line. Besides Album view, photos can also be sorted by Location and Time. Getting inside an album displays all the photos in a rectangular grid, which is horizontally scrollable. When you try to scroll past the last image, the photo thumbnails will tilt to indicate that you're at the end of the list. The Galaxy Fame employs the same TouchWiz-ed music player as the Galaxy S III. Samsung has enabled equalizer presets (including a custom one) along with the sound-enhancing SoundAlive technology, which features 7.1 channel virtualization. The company also uses SoundAlive in some of their MP3 and Android-powered media players. Samsung has put its very good default video player on the Samsung Galaxy Fame. It offers several view modes - thumbnail grid, list, and folders.The grid view shows static video thumbnails (unlike the handset's more powerful siblings, which animate the thumbnails). Unfortunately the video player has poor codec support, and wasn't able to play DivX and XviD files, nor anything above 480p resolution. For the files it does play, however, the video player lets you Auto play the next video, as well as enable SoundAlive. Unfortunately, subtitle support was also missing, likely another sacrifice due to the weak chipset. The Galaxy Fame is equipped with an FM radio with RDS too. The interface is simple - there's a tuning dial and you can save as many as 12 stations as favorites. You can also play on the loudspeaker, but the headset is still needed as it acts as the antenna. You can record radio broadcasts as well. 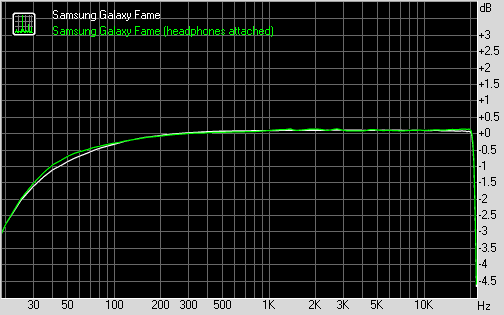 The Samsung Galaxy Fame did quite well in our audio quality test. The smartphone couldn't impress us with its volume levels in either of the test parts, but it had a decently clean output, which is more than good enough in this price range. When connected to an active external amplifier the Fame managed excellent scores for signal-to-noise, dynamic range and stereo crosstalk, while IMD and frequency response were average. Total harmonic distortion was pretty good, though. When we plugged in a pair of headphones, stereo crosstalk increased quite rapidly but the rest of the readings remained virtually unchanged. The volume levels were still low though, though.